In the Winter War, Finland fought for its existence. Finland was prepared to go to war against the Soviet Union, but it was not prepared to fight the great power alone. The war began on 30 November 1939 without a preceding declaration of war. The home front was faced with the horrors of war on the very first day, when the enemy bombed 16 localities, including Helsinki, Viipuri, Turku, Lahti and Petsamo. The 105 days of battle of the Winter War ended on 13 March 1940 in a peace treaty signed in Moscow the previous night. The Winter War (1939–40) was fought during the Second World War without becoming part of it. The Winter War was left as a separate war that was fought between the Soviet Union and Finland. In contrast, the Continuation War, which began in summer 1941, was part of the Second World War. The battles of the Soviet Union’s Red Army during the Second World War began when Germany launched its attack on 22 June 1941. On 2 December 1939, the Soviet Union and the Finnish People’s Government, which had been founded in Terijoki (Zelenogorsk) on the previous day, signed a treaty of mutual assistance and friendship. 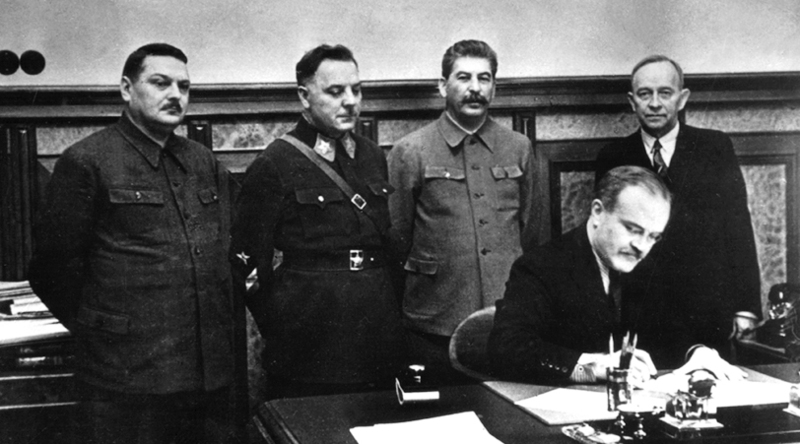 People’s Commissar for Foreign Affairs Vyacheslav Molotov signing the agreement. Behind him, Chairman of the People’s Government O. V. Kuusinen. On the left side of Stalin, People’s Commissar for Defence Kliment Voroshilov and Chief of the Leningrad Communist Party Andrei Zhdanov. Image: Photo12/UIG/Getty Images. The Soviet Union’s ultimate goals in the Winter War became clear as soon as the war began. The Soviet Union founded the Finnish People’s Government, led by Otto Ville Kuusinen, in the occupied town of Terijoki (Zelenogorsk). Kuusinen, who was appointed as the prime minister and minister for foreign affairs of the Finnish People’s Government, had fled to Soviet Russia from Finland in 1918 and made a political career in the Communist Party of the country, which became known as the Soviet Union in 1922.
belligerent and only sent volunteers to Finland. Sweden and the other Nordic countries refused the Franco–British plans to transport troops to Finland through their territories. The main goal of the United Kingdom and France in Scandinavia was to gain control of the Kiruna ore mines in Northern Sweden, which were important to the German war industry. The allies were also interested in the coast of Norway. They wished to avoid war against the Soviet Union. On 5 February 1940, the Anglo–French Supreme War Council decided to send military assistance to Finland. The plan was to send a military expedition to Finland via Northern Norway and Northern Sweden. Some of the troops would have been left to protect the transport route, which travelled via the Kiruna mine area. Norway and Sweden refused the United Kingdom and France’s requests for passage. The decision by the United Kingdom and France to send troops to Finland was one of the reasons why Stalin decided to abandon his plans to occupy Finland. According to notifications made after the war by the Finnish Defence Forces and the Ministry of Defence, the Finnish casualties of the Winter War totalled 67,000 people. The total number of Finnish soldiers killed and left in the field was over 24,000. When added to the number of people who died of their wounds, in air raids on the home front and in the service of the Finnish Merchant Marine, the total number of casualties was over 25,000. The peace treaty that concluded the Winter War was bitter for Finland. Finland was forced to cede approximately 12% of its territory and lease the Hanko Peninsula and its surrounding waters to the Soviet Union as a naval base. The ceded areas included large areas that had never been captured by the Red Army in battle. As stipulated by the peace treaty, the Soviet Union returned the area of Petsamo, which had been captured by the Red Army. Practically the entire population of the ceded territories was evacuated and relocated into the remainder of Finland. The evacuees totalled approximately 420,000 people, i.e. almost 12% of the population of Finland at the time. The Western powers considered the end of the Winter War to be their loss. The opportunity to gain control of the Kiruna ore mines in Sweden had been lost. The supply of weapons to Finland was stopped, and the Western powers demanded that weapons previously sold to Finland be returned. The peace treaty signed by Finland was interpreted as Finland’s surrender. This notion still lives on in some of the West’s written history. Another notion that still lives on is the claim spread by Soviet history books that the Red Army had captured Viipuri (Vyborg) before the peace treaty was signed. In truth, the city centre was still held by Finnish troops when the treaty was signed. The Finnish flag still flew in Vyborg Castle. After the end of the Winter War, the Soviet Union rejected Finland’s plans to establish a Nordic military alliance and later the plans for a confederation between Sweden and Finland. Sweden held firmly to the declaration of non-belligerence that it had made during the Winter War, in which it refused to assist Finland in the war against the Soviet Union by sending active troops. Finland was more isolated than ever after the Winter War.